HELL-ON-LINE presents a comprehensive collection of over 100 visions, tours and descriptions of the infernal otherworld from the cultures of the world: principally from the Hindu, Buddhist, Christian, Zoroastrian, Islamic and Jewish traditions from 2000 BCE to the present. THESE TEXTS reveal the development of hell and its relationship to ideas of judgment, reincarnation, salvation, the apocalypse, and cyclic time. Visionaries and voyagers describe the geography of the underworld. Much like any other travelers, they lay out locations and distances, compass points, and physical characteristics, especially the surface features: oceans, mountains, rivers, roads, bridges and ditches. They also describe the inhabitants  both human souls and evil spirits  and the relationship between them, as they fulfill their particular doom, engendered by sins committed in this life, according to the laws and norms of the next life. THIS COMPILATION of texts and images describes the place that has preoccupied the imagination for two millennia. From hells origins, through its mature formulations across a verity of world cultures, to its questionable status in our own hands and minds, the selections will include texts from across the world  including several works never before available in English  and images from historical cultures to the current press and cinema. 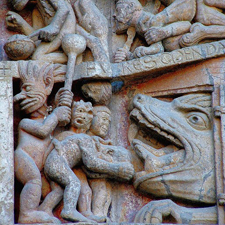 THIS ON-LINE AND PRINT RESOURCE is a work in progress and will serve as a searchable encyclopedia on the history, geography, population, motifs, and meaning of hell throughout its long history. Introduction, timeline, bibliography, interactive index, interactive map, and other electronic tools. Six print volumes to date. Downloadable texts are in JSTOR and Kindle formats.